Club Penguin Cheats by Mimo777 Club Penguin Cheats by Mimo777: How Many Club Penguin STAMPS do you have? I gotta admit. 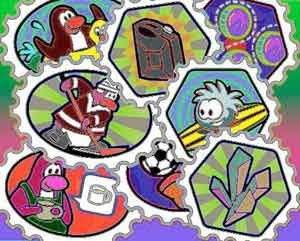 I love the whole Club Penguin Stamp thing. I love how hard it is. I love all the different ways it takes to get them. I love the Stamp Book. Me Santa holds the household record of 41. I think we should have a contest to see who will be the FIRST Penguin to get to 1000! I have like 49ish maybe 50. Plus, some penguins would lie. Hey, cool idea Mimo. I have 91 Stamps so far. Going to work real hard to get the last few. Good luck with everyone and their stamps! Right now I need the 5000 point combo when shooting the tube, the two survival mode stamps, and the astro30 stamp! Well Mimo, theres a problem there. There arent 1000 stamps. Or did you mean 100? I have 99 Stamps on my Member account Jimbobson 2 (It took A LOT of work!). If you need proof feel free to contact me. I have 85 Stamps, I am working my way up to the max stamps. I have been trying really hard everyday to get as many stamps as I can. Ywah Right! i bet you 1 million dollars that you used cheats! Well I have 87!!! And im still hunting!Waddle on guys!!! I have 51!!! working hard still! I am having a hard time with the catching waves ones!!! 8zario101: i have 53 woot! i only have 29 i dont really care but its fun! I am a nonmember and i hav 24:( i havent been on in a while so i started going on like a week ago. I've got 'em all!! I used Microchip123's Stamp Cheater!! Rofegme, it doesnt matter. its just a contest. Jeez, what an over reacter! Thats not right. That is hacking, and that ruins the fun. You could get banned for that. You better not see me in CP or your gonna get reported. I got my eyes on you! That's impossile. You can only have 99 max. Way to go! Thats the most I have heard a non-member having! Sorry I haven't been modding Mimo, I have been extremly busy the past week. Awesome! I only have 35. I'm going to go try to earn some stamps! Don't be mean or rude in comments! You mean out of 107? I have 99 but I also had some Puffle Rescue before they were removed. i have 99 stamps! took a while. I have all 107 of them!!! Hi Mimo, I got 99 Stamps!!!! It took me hours to get them. Specially the thin ice stamps, because im really bad at it. I can send you a pic if you want. That's pretty good. Good work! I have 55.Only cause im a non member. Very hard work. Very fun work. I am a member and I have 58 stamps. i have worked really hard and got all of them except the character ones. i have 79 stamps so far. the hardest ones are the astroMax 20 and 30 it says to beat levels 1-20 and 1-30 without missing . it makes me so angry. those are the only ones i need for astro barrier. but i think thin ice was east to get all the stamps. but i think that those astro barrier stamps that i mentioned should say "beat levels 10-20 and 20-30 without missing. just saying. I am a member and I have 58 stamps, the most of anyone I know. i have 99 stamps witch is currently the max you can get. BTW, it will take years for CP to release 1000 stamps. Sorry if it sounded like I was overreacting. I was merely trying to point out that a contest to get 1000 stamps would be quite unfair, because members would get 1000 first. This board is perfect! I need help!! I can't get close to the Catchin Wave's "5,000 point Shooting Tube Combo" Stamp! I need help! I have 100 pins; 37 stamps without bring a member! hey me SANTA i got 41 as well!!!!!!! Awesome! Great job on earning them! i have 99 stamps and i EARNED THEM!!! not like the other ppl who used stamp cheater!!! I wish stamp cheater was never invented.now it looks like i cheated them instead of earning them. i earned them all!! CP PLZ BAN THE STAMP CHEATER!! PLZ CP! You better not see me on CP... Oh and you could get banned for using that. It's a hacking program. I have 38. I am a member. I've been working hard. Stamp collectin rules! I got about 2 stamps LOL,im too lazy to collect them. Actually currently the max is 99 because there are 107 but the 8 that are left you have to be in the same room as a famous penguin. So pretty much for now whoever has 99 congrats you have all of the stamps you can get for now! Well I have 43 stamps but going to get more and more! i have 107 no joke! I have all the stamps other than the RH G AA PB and the DJ-C ones!!!! Woah. It took me HOURS to get about 10 stamps! I have 99 too... The astro barrier and mullet were SO HARD! hello i get 53 stamps and not a member! GETTING CLOSE to 99! HAVING A QUICK PARTY! What: Please wear a blue hockey jersey so I can get the stamp, and maybe you too! When: 8 am Club Penguin Time! I have 99. I'll even post a screen shot on my own blog to prove it if I have to. I have 98 stamps so far! Including Games and Activities! Something like 43. lol I fail, and I'm proud! I have 35. But my friend has 98. I have 99 stamps. My friend was too lazy to try to earn them so he cheated them. Thats impossible. Right now penguins can only get 98. Because no famous penguins have been online yet and the ice rink isn't back! 98 because the ice rink isn't out! Thats impossible. The highest is 98. I have 98 stamps i was working very very hard to get those many stamps. I have a total of 99 no cheats just hard work! Very true my account name is slippy246810 if you see me you will no! I have a total of 99 stamps! I have 51 stamps it's really hard! I got 99!!! I only need the celebrity stamps! I'm honestly betting that all of the people that have 99 use the Stamp Trainer or they have no life at all. And the people that say they have more than 99 is a complete LIE, manly because you can only get 99. Oh, and I think I have 75 - I know that I have something between 70 and 80. (my internet is slow so I can't check). I officially have 99 out of 106 stamps. 99 baybee! yeah! :D! i got 99 it was really hard to earn them all but i did it. 99 For Me And it Rocks To Show The Off .. All The Hard Work paid Off !! I have 97 Stamps now, and I love it too! i have 60 and everyone who has 99 most of them just used cheats. I have 99 all you can get. I've got 58, I got nearly all of Aqua Grabber ones tho! Hey mimo! I got 37 stamps or was that 35?I forgot how many stamps I have! Oh well I'm catching up me Santa ! LOL!!! Ive got all 55 non member stamps I've been working really really hard! I guess I deserve it. Cheater XD i used it 2! That shows how low your challenge rate is. Why use cheats? Knowing you didn't earn them for real will strike you one day. I got them all besides the character ones and the pizza apron one in the activity section. I didnt cheat! I gots 26. Mostly from catching waves. If you only have 17 then you aren't really trying, are you? My Name Is Ace Carrey9, And I Have 99 Stamps[NO HACK]!!!! i have 99 stamps! its amazing! Keep commenting & modding everybody! I have 99 stamps and Im member!